Last night my husband made dinner. “I don’t trust anything that isn’t packaged in plastic,” he joked. Due to our heavy reliance on all things Trader Joe’s, salads, pizzas, wraps, pastas, you name it, are prepared and packaged. Every meal is quickly created by mixing, boiling or heating. Occasionally extra veggies are cut or a little cheese is shredded, but the salad dressing is in the package, the sauce to be added (not created) might be from another container. Sometimes we slice some bread. I’ve often thought we’d starve were it not for TJs. How did I get here? I was the organic recipe seeker, the baby food maker, the farmer’s market shopper. Now I can’t be bothered to make coffee, let alone grind it from fresh organic, free market beans. No, I pop in the k-cup of Peat’s high-octane blend as I fly out the door, feeling good about the fact that I didn’t stop for coffee at the local Starbucks. Good about saving time and a little money. But annoyed by the fact I had to add water to the machine. Not too long ago I would regularly cook a meal, with ingredients that were chosen, cut, sautéed, broiled, or baked by me. Leftovers existed. The quick meal was on Friday, when we were all out of “real food.” Real food seems to be something I plan to do. Just not right now. You see, I’m late. I’m hungry. I got to go. I don’t have time. But time has always been scarce. Even in the past when I cooked and shopped for my family. The change is the family. As they went off to their own lives, the need to make a real food diminished. The few that remain were often off doing, and getting home late. Meal time became a solitary venture. The lack of others diminished food’s importance. Full disclosure, I’m not a foodie. Left to my own devices, I’d gladly eat Triscuits and cheese for dinner. Until I get thirsty and then I’d have some seltzer water. The trouble with this is not just the lack of environmental friendliness, increased cost and high salt intake. It’s the isolation, the lack of human interaction, discussion, and connection. Being alone can be a nice break for an overburdened parent, but too much of it is just not healthy. Luckily, in just a few weeks, the holidays will bring family home. Whether out of guilt or habit, they come back and with them come routines, rhythms, and expectations. Some of it is strange stuff: sibling to sibling and child to parent interactions that are struggling towards adulthood. But with it comes good things, real food and discussion. I’m still moving from what was to what could be. I’m just a bit lost in transition. I wonder (my one little word for 2014) what might move me towards this after the holidays pass. 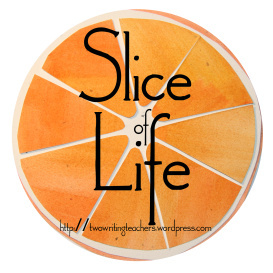 Thanks to Anna, Betsy, Beth, Dana, Stacey and Tara for Slice of Life Tuesdays at Two Writing Teacher blog. A wonderful place to share our thoughts and writing. Read more slices here. Yep, I am hearing you loud and clear. From a mum who used to do a weekly shop, grow her own veges and have her own chooks, to walking in the door at 5pm and saying what will we have for dinner and then the mad dash to the grocery shop for ingredients, just enough for that night. If we were not coeliac I am sure much more of our food would be out of a packet too. I could really relate to your slice today. Loved the honesty in this too. Enjoy your family during the holiday times!! Eating meals is always better when we are surrounded by those we love! Food is a metaphor for life, right? And reflection on how we have shifted and maybe what shifts we need to make (or remake) is a key part of writing. Your post had me thinking of our house, where the craziness is always in play. We do try to eat our family meals together (although our teenage sons are not always happy to engage in conversation!). Thanks for your post. May you find the time to make something good in ways that nourish your soul. How would life change if you didn’t have TJ? That’s my life, no TJ, so I don’t know all the quick meals possible. Guess that’s not such a bad thing. Lately I’ve turned to Pinterest for my cooking inspiration. Most of the recipes are not time consuming. Enjoy the possibility of cooking during your holiday break. I was the “Betty Crocker” of my family. I still am for many things, but not how it used to be. Family meals are still a staple at our house, but I see that changing all too quickly! Soon it will be just my husband and me and I am sure I will be right where you are. Here’s to real food that you will hopefully find during the Christmas break! You have written so much to comment on, Julieanne. Trader Joe is an important guy in our house, as well, but I miss the summer nights when we celebrate cooking and then eating what we’ve made together all around a big table. During the fast paced school year, we settle in to eat to live and not live to eat, but the I love the point that you make about the socialization that happens around a dinner. Point of conflict: I do not like Triscuits at all–if I’m ever around, make sure that the crackers of choice can be rice crackers. I can’t wait to see where this journey goes for you. I too, have been on a food journey, and work to cook real food for my family. Some weeks it works, some weeks it doesn’t. 🙂 I hope you share more after the holidays about this journey! Maybe as well as the good food, you’re missing the table talk surrounding it, Julieanne. I do miss the camaraderie of cooking with someone, and know I’ll enjoy having my son and family here during the holidays. I love that you’ve noticed the change, which will be the spark that makes a turnaround for you. As I talk to my students, I know that they don’t often eat as a family either. There are too many activities going on they need to attend, or their parents do. Interesting changes here in this time. I love this piece as well. Tuvia and I eat at least one meal a day out and I see a nutritionist. does that make sense? Enjoy your family back together for the holidays. Slow down, make some “real” food and enjoy each other! Happy Holidays, Julieanne! The joke in our family, once I went back to work, was always saying a quick “Thank you, Trader Joe’s!” So, yes, this is a struggle I have, too. But you are right – the holidays are the perfect time to make up for lost opportunities to cook, sit together, and enjoy that type of family time. I could so relate to much that you write here. I try to cook 3-4 meals a week, and I feel really good when I manage that. I love to cook, but I love to cook best when I don’t have as many other claims on my time. During summer break, for instance. When I lived alone, I ate toasted cheese pretty much 7 days a week for dinner and was perfectly happy with that.